NEWW (New England Webcomic Weekend) was so lovely this weekend. I had fun, I had lovely conversations with readers who stopped by, and I got to meet a good number of webcartoonists who I really admire. The talent in the room was truly awe-inspiring. 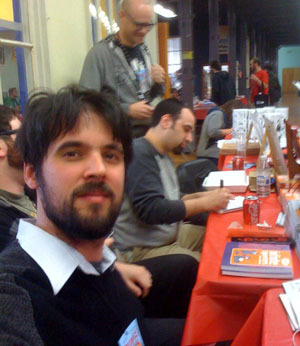 For instance, the above picture I took of me at my table: right behind me is Jon Rosenberg of (Scenes from a Multiverse & Goats), and behind him is MC Frontalot, and at the end of the table is Kate Beaton. It was weird to realize that if that building suddenly crumbled, that the face of webcomics as we know it would change (don’t get any ideas, I’ve seen these folk arm wrestle, and you don’t want to mess with ’em). And that’s not half the people I got to meet and talk with. AND I just realized Jon Allison (Bad Machinery) was there?!! Jon, I didn’t know, I only know that a few times I saw this guy walking about and thought “he is totally some young upstart imitating Jon Allison.” And come to find out, it was YOU! And a last and most special thanks to the organizers, Jeffrey Rowland (Overcompensating) and Holly for all the work putting the con together as well as for running TopatoCo which has been so great to me. The indestructible Rich Stevens (Diesel Sweeties) and the unflappable Meredith Gran (Octopus Pie). And now, it’s late, and I get to sleep. @Frank, with three chords hammered out on a pipe organ! @McGee, I’ll wager it’s Kuu-Drahc, impeccably dressed as always. He’s just dropping in to discuss some urgent matters with Gurf’s mom, and to catch up (as it were) with his old, dear friend and partner-in-wandering Nogg. The squad of armed mercenaries accompanying him are just his protective detail, you see. Man in all the crazy at NEWW I missed you. Bummed about that. Hopefully you’ll be there again next year! Thanks for making a great/funny/weird-in-a-good-way web comic! my major problem with this great comic is that it’s only 2 days a week…now, once again I have to wait. damnit. NEWW was great fun, and I’m glad I got to meet you and John Allison (if I’d known you didn’t know John was there, I’d have told you – he was usually hidden in the Dumbrella room), as well as several others. Thanks for the Spacetrawler sketch! Hey, man! It was great meeting you Sunday. Easily worth the 100 mile drive, and the high point of the convention for me. Thanks for the great sketch in the Dee book I bought. Keep up the amazing work, and I’ll keep saving up my shekels for that original art we were talking about! What I don’t get is why the aliens find Dimitri so attractive. Is it because he’s Russian? You too, @Sean and Dave. @Sean, those were the best, EVER! I love that Dimitri is such a charmer. The happy closed eyes and little kissy mouth on the alien… adorable. She (? it, they, he, der, skee, whatever!) is totally smitten. Dimitri must be keeping up his end of things… so to speak.